Utilities stocks, as measured by the XLU etf are one of the few bright spots today, trading up 1/2 a percent on a day U.S. stock markets are down about 2.5%. The XLU is up 9% on the year, and up 19% from its 52-week lows made in early February when stocks were in the throes of a 10% plus correction. 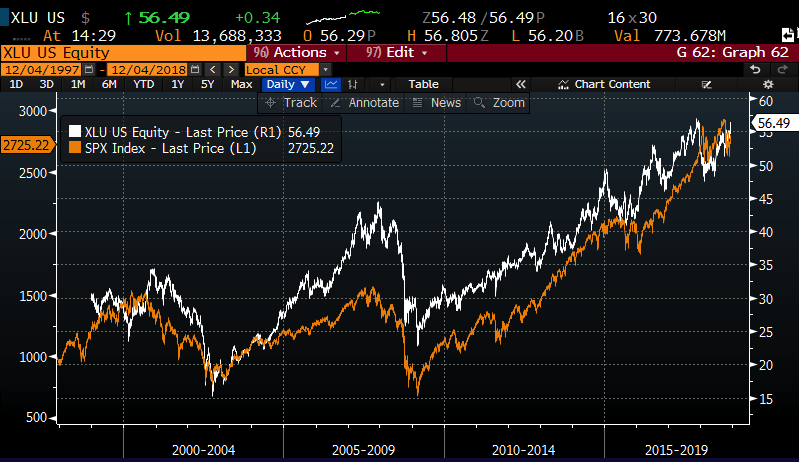 I guess the main takeaway is simple, while groups like utilities are deemed to be “defensive” ultimately if we have a prolonged correction they are likely to be very highly correlated to value and growth stocks. Oh and one more thing, in a market that is in the midst of a retest of a fairly sharp correction of a month earlier, and the average stock in the SPX down more than 20%, short-dated options prices have shot up in most groups, making long premium directional bets harder to earn out. 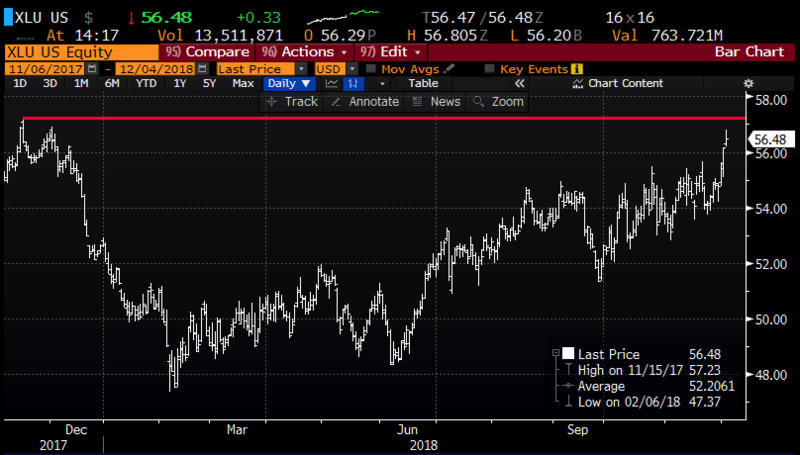 But in the case of XLU, short-dated options premiums (implied volatility, the price of options) are trading at the widest spread below realized volatility (how much the underlying is moving) about 13% to 16%, making long premium bets attractive for those with a directional view. So what’s the trade? Defined risk bearish bets in the XLU make sense to me here for a couple of reasons. While there is obviously a chance that the SPX remains volatile into the new year, and investors continue to hide out in safety stocks and the XLU makes higher deliberate highs. 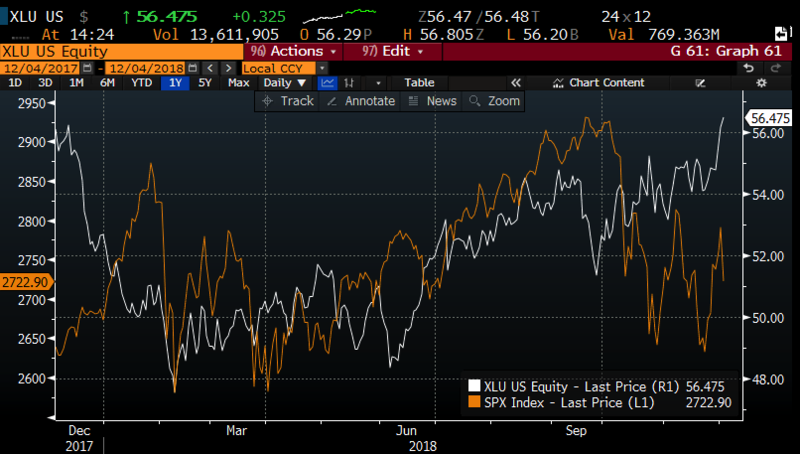 But I think there are a couple ways you can win with XLU put spreads… first if the SPX were to find its footing in the next couple of months, there is a good chance that the XLU etf would pull back a bit, possibly to the low $50s. And Second, if the markets were to make lower lows, then history suggests that the XLU will follow suit. 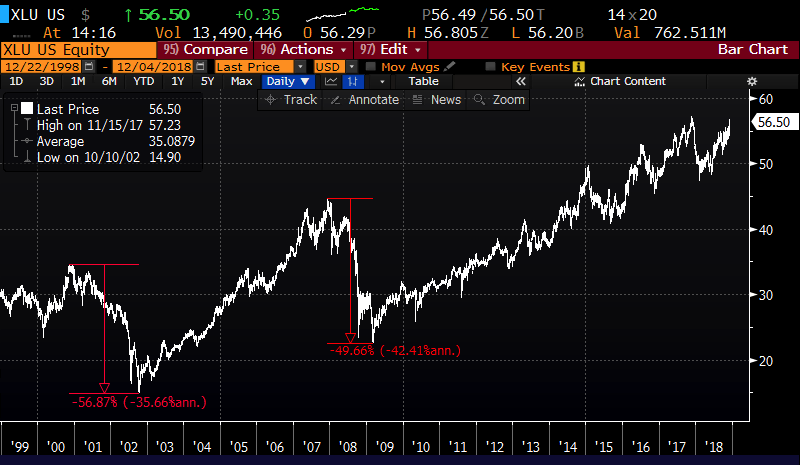 Rationale: risking $1 or 1.8% of the stock price to possibly make up to $5 or 9% if the XLU is down 13% in a little less than four months, back towards its 52-week lows.